How to create AJAX Tabcontainer Tab Panel in ASP.NET? In this article I have explained in detail about AJAX Tab Container with multiple tab panels. For example we required lots of information from user during registration that time not able to display all textboxes one by one. So we can group it and display in tab panel. 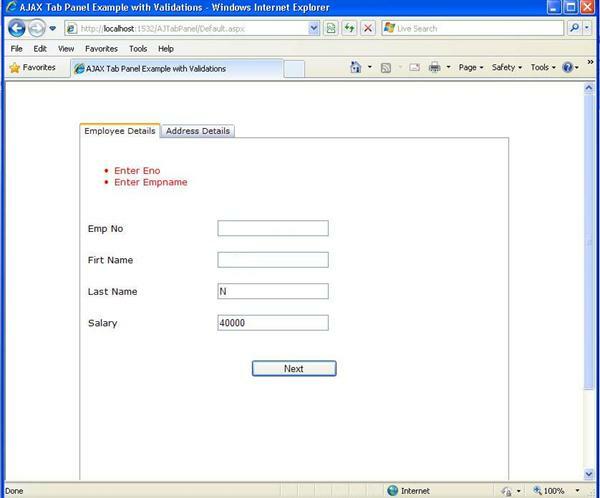 If we use multiple tab panel in the tab container then validation must be followed as proper manner. For example I am placed submit button in second tab panel if user cannot enter text box value in the first tab panel then we need to focus first tab panel when user click submit in the second tab panel. &LT;asp:RequiredFieldValidator ID="reqeno" runat="server" ErrorMessage="Enter Eno" ControlToValidate="txteno"
&LT;asp:RequiredFieldValidator ID="reqename" runat="server" ErrorMessage="Enter Empname"
&LT;asp:Button ID="Button1" runat="server" OnClientClick="return ChangeTab('TabContainer1','1');"
&LT;asp:Button ID="btnSubmit" runat="server" Text="Submit" Width="120px"
Here with I have attached source code of AJAX Tabcontainer with multiple tab panel example download and try to learn this concept. I hope this article help to know AJAX Tabcontainer with multiple tab panel.